The Boston Public Garden is oldest public park in the country, with relaxing swan-boat rides in the park's lake. Each swan holds 20 people so bring the family. Parents can park carriages at the dock. The Swan Boat ride lasts about 12-15 minutes while the driver pedals you around the Public Garden lagoon. Tickets are purchased at the Swan Boat dock prior to your departure. The Swan Boats operate from the third week of April to the third week of September. Weather permitting; boat rides run from 10:00 am – 4:00 pm through Labor Day. From June 21 - Labor Day, you'll get an extra hour (they are open until 5:00 pm). 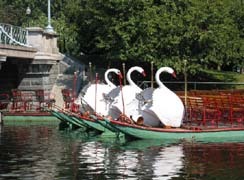 Swan Boats are located in the Boston Public Garden - 24 acres bound by Arlington, Boylston, Charles and Beacon Streets. The MBTA Green Line Arlington Station is the closest 'T' stop. From this stop, it is approximately a four minute walk through the Public Garden. Boston Common Underground Parking Garage on Charles Street is the closest parking garage. Parking meters are available on the surrounding streets. Hotel and other parking garages are also in the area. Restrooms - The closest public rest room is located in the Boston Common. After you enter the main Charles Street gate, turn left and head towards Beacon Street. There are also rest rooms at the Frog Pond refreshment area and at the Visitor Information Center near Tremont Street. It's beautiful, inexpensive and fun! Just enough time to keep the attention of three-year olds, too.